Floplast's HiCap Deepflow Gutter is perfect for any roof that is has a larger than normal surface area or perhaps a steeper pitch. The rate at which water flows inside a deepflow gutter is more than twice that of a standard half round system, meaning that it roofs fitted with this system can cope with higher flow of rainwater. It also means that less downpipes are required, reducing the overall system cost particularly if the cost of surface water drainage is taken into account. 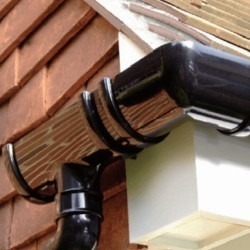 Our Deep Flow Gutter can be connected to most other Deep Flow Systems without the use of any adaptors, a standard Gutter Union is all that is required. However we would advise that you take a look at FloPlast's compatibility chart to check. You will need to know the manufacturers name for the system that you are connecting to. At Professional Building Supplies we stock every colour that this system is manufactured in - Black, Brown, White, Grey and Cast Iron Effect. 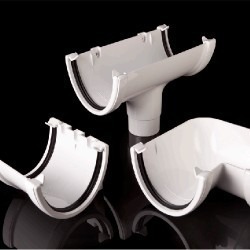 The running outlets on the Deepflow system are a standard connection to 68mm circular downpipe. 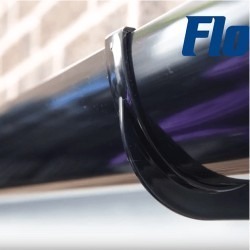 There is no requirement for a larger downpipe for this system as despite the increased flow rate, 68mm downpipes already have a much greater capacity than any type of domestic gutter - the capacity of a gutter system is always determined by the gutter and not the rainwater pipe. Professional Building Supplies Deepflow Gutters are British Standard Approved and as such they are guaranteed for 10 years. Please take this into consideration when comparing other systems that are available in the UK. This system is installed in exactly the same way as any other PVC Gutter system. Despite the increased capacity there is no requirement for additional support brackets or unions, as all of the fittings have been engineered to suit the larger flow rates of this gutter system. In areas of potentially heavy snowfall we would always recommend that consideration is given to installing the Snowguard system - this is relevant whichever style of gutter you choose. For a PDF installation sheet for PVC Gutters please visit our guides and tips section. Want some advice on how to install your Deepflow Gutters, or interested in finding out more about our product range, take a look at our guides & tips. Does Deepflow Gutter Need More Fascia Brackets Than Other Systems? Why Does Deepflow Use The Same Size Downpipe As Half Round?